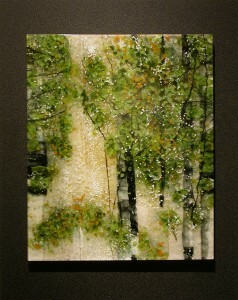 Glass panel, 17.5 by 14.5 inches. Frame, 24 by 19 inches. A transitional piece, not quite fish or fowl. More of a study. Those look suspiciously like aspen in there, but they are nicely hiding behind clouds of spring green, the composition floating on a desert/snow bank/prairie of the Great Plains, in French vanilla. Must be an abstract….